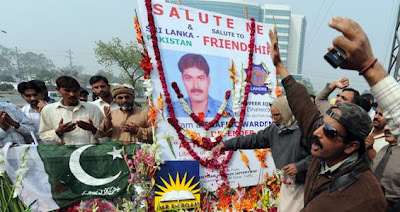 The Islam Awareness Blog: Pakistanis = Terrorists? Pakistan was in news for wrong reasons again last week when Sri Lankan cricketers were attacked in Lahore while they were going to the stadium to play cricket. As you would expect, Initially Pakistan minister did blame India but there were also rumours of this being inside job. You can read analysis of the situation in every paper and depending on whether its left wing or right wing, it would either blame or sympathise with Pakistan. Lahore is a open-minded place often called the "city of culture". Its airport, in marked difference to others in the country, is not named after a politician but after a poet - Alama Iqbal. There is a saying here: Lahore, Lahore Hai. Translated it means Lahore is Lahore. It is shorthand for what many over the years have called Pakistan’s most welcoming city. An acknowledgement that there is nothing like it. Pakistanis are proud of this city and it inhabits a unique place in Pakistan, one where Christian churches are common and the facades of old colonial buildings hide hints of the past. It is a multicultural city with pockets of ancient Sikh, Hindu and Christian communities sitting alongside the predominantly Muslim one. But even as a Muslim city Lahore is unique. It has what can only be described as a soft "red light district" of sorts, a place where dancing girls provide entertainment for their clients, tapping into an ancient tradition that stretches back to the Moghul empire. Although the reality of this is less romantic and, perhaps, more business orientated. The girls dance in the shadow of a grand mosque as round the corner families spend their time on Food Street, eating and talking late into the night. It is here, in these ancient streets, that Lahore's poets wrote of how the city was free and welcoming. It is a tradition that Lahoris keep alive. Ali is a taxi driver who has worked Lahore's battered roads for the last 30 years. Normally a chatty fellow, the attacks have unnerved him. "I feel a real sense of shame, these people were our friends, guests in our houses... How could such a thing happen?" he tells me. It is a common theme developing throughout the country, that this attack has not only hit politically but at core of something Pakistanis, in particular Lahoris, excel at; hospitality. Pakistanis are normally resilient people being used to seeing suicide bombers on the streets and war within their borders. Despite all of that, ordinary Pakistanis at the airport, in their homes, in cafes and restaurants will always try and welcome a stranger with open arms and an open heart. At a newspaper stand I get a sense of the upset and its fallout. Covered in the city's dust the headlines are, nonetheless, stark: "Terror at Liberty" and "Mumbai Terror Visits Lahore". Newspaper columnists bemoan the tragedy. One newspaper simply stating: "Even our most esteemed guests are no longer safe in this country." That the attack took place here, in this city has, at least in the mind of political analyst Imtiaz Gul, underlined the precarious situation Pakistan finds itself in. "It's a clear message, that there are forces out to destabilise Pakistan and they are doing what they can to create instability and insecurity," he says, before adding that "nowhere seems to be safe". And that is perhaps the ultimate goal of all terror. To strike at the heart of what ordinary men and women hold dear, and one thing Lahoris and Pakistanis hold dear is cricket. Anyone with even a vague familiarity with the subcontinent knows that cricket is more than just a sport. It is a national passion. Last year a report mentioned that An anti-terror petition in Pakistan has attracted almost 63m signatures in what is believed to be the biggest such lobby effort anywhere in the world. A third of Pakistanis signed up to denounce acts of terrorism in a campaign titled Yeh Hum Naheen - This is Not Us - over a period of just four weeks. That easily shattered the previous record for the largest petition, the 24 million people who signed the Jubilee 2000 campaign against developing-world debt. Children over the age of 11 were allowed to take part, given the young age at which extremism is taking hold in society. Yeh Hum Naheen, financed by British and Indonesian Muslim businesses, launched last year in Pakistan with a hit song featuring some of the country's biggest stars, including Ali Zafar, who has a fanbase in Britain. He said that all 62.8 million signatories had to verify their identity and most of the names were collected in face-to-face canvassing, though it was possible to take part by text message and online. Campaigners are verifying the milestone with the Guinness World Records. The cream of Pakistani actors have backed the campaign, as well as the media industry, with free airtime and full-page newspaper advertisements donated in a promotional blitz that kicked off this week. In parliament, the new head of the Inter-Services Intelligence Agency, Lieutenant General Ahmed Shujaa Pasha, displayed gory images of militants slaughtering soldiers and tribal elders. Amos Oz: What goes around comes around!